More than technology, Attend Anywhere is a systemic framework and approach for achieving the benefits of mainstream video call access to existing health services. For video call attendance to be a standard, everyday option, it must be painless for service providers, easy for administrators, simple, scalable, and sustainable. Capabilities must offer cost and convenience of using the telephone, or social video services like Skype or FaceTime, but without the drawbacks. The goal is to mimic, as close as possible, the way things work today, without extra processes or resources. Forged in Victoria, Australia, the model has evolved over many years of collaboration with clinicians, health services and universities. It addresses barriers to scale and sustainability, which are primarily operational and workflow integration related, as opposed to technical. In many cases, a video call is just another access option to an existing service. If they sit in a physical waiting area before being seen, then use an online Waiting Area workflow. If they are taken directly to a physical meeting room, then use an online Meeting Room workflow. 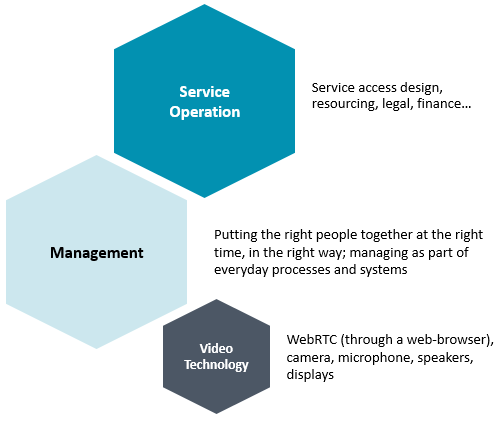 Service Operation: Governs access design, resourcing, legal, risk, and financial issues that surround a particular service. ​(Support for video consulting adoption and evaluation). Management: Governs how the right people come together at the right time, in the right way. Video Technology: Governs the technologies used for the video call itself.